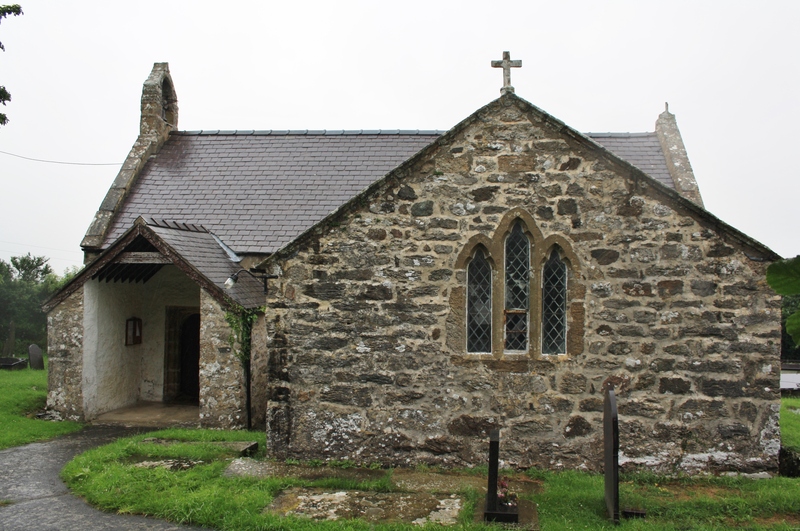 This was a second visit to Llaniestyn, both on particularly gloomy, wet days, though I’m sure this is coincidence and not characteristic of the place. Llaniestyn is a small, sparse parish close to Llanddona in the south eastern corner of Anglesey. Iestyn, its patron, is said to have been a nephew of local hero Cybi, and a brother to Saint Cyngar. A second parish is dedicated to him on the Llŷn Peninsula and he was also active further south, in Cornwall and Brittany. Some commentators suggest that he is the same saint as Justin or Just. His feast day is celebrated on October 10th. 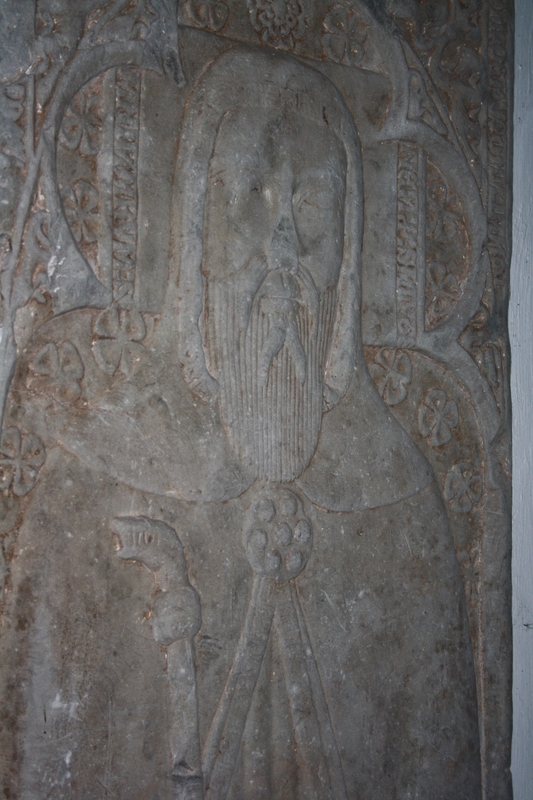 The main item of note in the church is a striking 14th century relief of Iestyn, in the distant past it was thought to be his grave slab, but its date shows that it couldn’t be. It used to lie flat by the altar, but which is now upright on one of the walls. The parish was once a part of the lands of the priory at Llanfaes. Angharad Llwyd describes a stained glass depiction of St Catherine here in the early 19th century, but there is no evidence of it now, or any other recollection of it. Iestyn’s well is rarely referred to in any of the descriptions of the parish. The only account that I have found is that in Jones’ Holy Wells of Wales, which is repeated in the Gruffydd’s Fynhonnau Cymru . They record that water from the well was taken into the church for use in baptisms; and also that the local population refused to drink from the well believing the water to be cursed. This may be due to the local tradition of taking corpse pennies, the coins use to close the eyes of the dead, and throwing them into the well following a funeral. I have been given two potential locations for the well. Jones places it nearby in the corner of a field on Tyddyn Uchaf land; the Gruffydds qualify this by stating that it is to the north of the church. The most obvious location for this is marked on the map as a well beside the drive to the house now known as Tan-y-fynwent. Access to this location is very clearly unwelcome as shown below. I just assume that this is to prevent the unwary from falling victim to the curse. There is another spring in the corner of a Tyddyn Uchaf field to the east, this too was inaccessible, and probably to far away from paths to be a prime candidate. 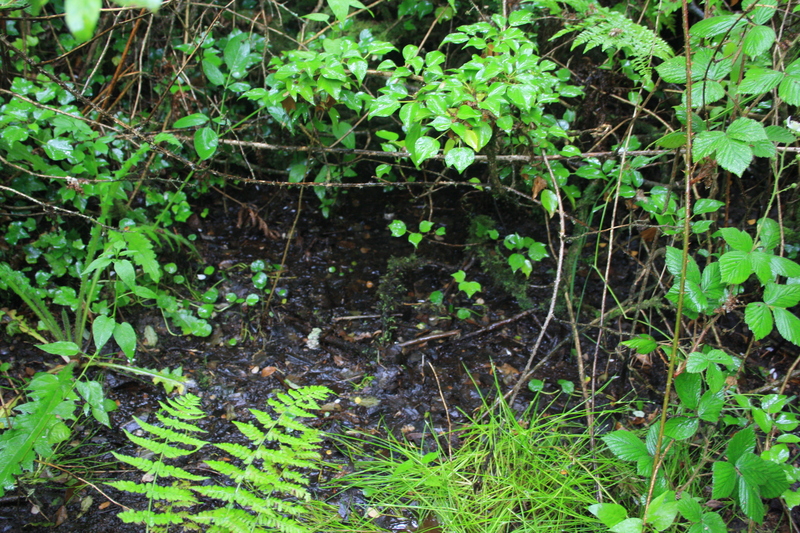 An alternative site that has been given is a well within a thicket to the east of the church. This is much closer to the road from Llanddona, but would have been accessible if the thicket has not been so dense in the past. Brambles and undergrowth restricted access, but the well is shown below. Maybe this was the well, and maybe the curse is still active. Certainly for the rest of the day after taking these pictures my camera refused to work. 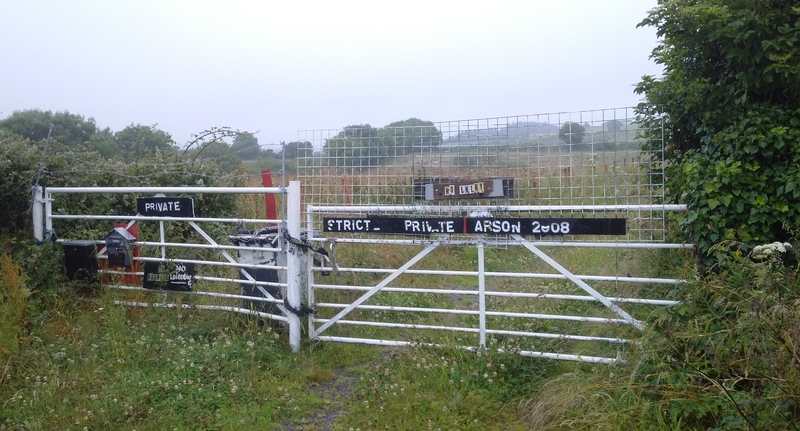 This has to be a work in progress type of post, questions about Ffynnon Iestyn remain open, and I’m sure further visits will be required. Maybe next time it won’t be quite so rainy. Tristan Gray Hulse had some ideas on this one – have you contacted him? You say that Ffynnon Iestyn is down in Tan y Fynwent surely they would not have a holly well set down from the church due to sepage from the graves. There is a well on Llaniestyn common that could be a candidate for the holly well. thanks for your thoughts. The only notes on a location come from Francis Jones’s book Holy Wells of Wales which says that “it is in the corner of a field on Tyddyn Ucha farm a short distance from the church”, although unfortunately he does not cite a source or date for that location. This does tend to point towards that spring by Tan y Fynwent. I agree seepage from the graveyard may be an issue – though he quotes an manuscript from the National Library of Wales when he discusses the use ff the water saying that originally the water was used in the church for baptism although this practice was discontinued as local people considered it cursed – this may support some theory of pollution possibly. I would love to hear of any more information or ideas you may have, i’m not sure whether you live in the area, I have not been able to obtain any particularly local knowledge or input for this site.